David Zuckerman joined The Democracy Collaborative team in 2012 and serves as Director for Healthcare Engagement. David leads the coordination of the Healthcare Anchor Network—a health system-led collaboration focused on improving community health and well-being by building inclusive and sustainable local economies. The Network includes more than 40 health systems to date. 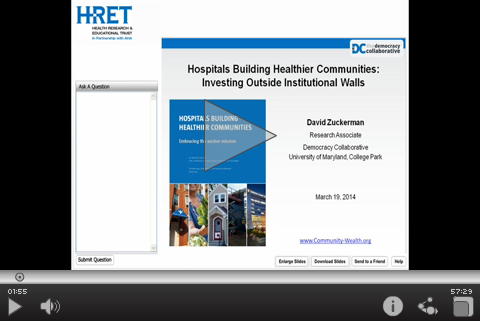 David is the co-author of the Hospitals Aligned for Healthy Communities toolkit series. His work focuses on inclusive and equitable economic development strategies that build wealth in low-income communities, with specific attention on how hospitals and health systems can deploy the business side of their institutions to support community health improvement and strengthen their local economies. David is also the author of Hospitals Building Healthier Communities: Embracing the Anchor Mission and a contributor to Can Hospitals Heal America's Communities. He is the lead author of a National Academy of Medicine discussion paper, Building a Culture of Health at the Federal Level. He serves as Treasurer on the Board of Trustees for the Consumer Health Foundation. This report, prepared by the Democracy Collaborative and submitted to the City of Jacksonville, Florida, highlights key strategic opportunities to leverage existing assets to build wealth in a neighborhood facing concentrated poverty and disinvestment. University Hospitals System comprises the 1032-bed, former academic medical center of Case Western Reserve University, and six community hospitals across Northeast Ohio. The system employs more than 24,000 people and generates revenues in excess of $2 billion annually. A key initiative has been University Hospital’s Vision 2010 project, a $1.2 billion, five-year strategic growth plan that started in 2006. As part of Vision 2010, University Hospitals set separate goals to procure from local, minority- and women- owned businesses, and actively aimed to create new supplier capacity within the city. It also hired a third party to hold it accountable, voluntarily entered into a unique Project Labor Agreement, and has now started to apply this vision to its entire supply chain purchasing. Further still, University Hospitals is involved in other job creation and wealth building initiatives in the community. Anchored by the 802-bed Henry Ford Hospital in Detroit, Henry Ford Health System has revenues of more than $4.2 billion, employs more than 10,000 people within the city and procures more than $650 million from its Detroit institutions. Henry Ford actively recognizes its position as an anchor institution, working with many partners to increase its impact in the community. Through a multi-institution partnership, Henry Ford has coordinated with Detroit Medical Center and Wayne State University to help revitalize Midtown Detroit by encouraging their employees to live, work, and invest in the same community. It has also helped found a local business incubator at Wayne State, set active goals to procure from local and diverse suppliers, and used its purchasing power to persuade suppliers to relocate to Detroit. Further still, Henry Ford has helped finance education partnerships for high-risk youth, is focused on acquiring and rehabilitating reclaimed properties, and has helped push local infrastructure improvements. An interview with the Democracy Collaborative's David Zuckerman on the Community Wealth Building Roundtable convened by Jacksonville mayor Alvin Brown.